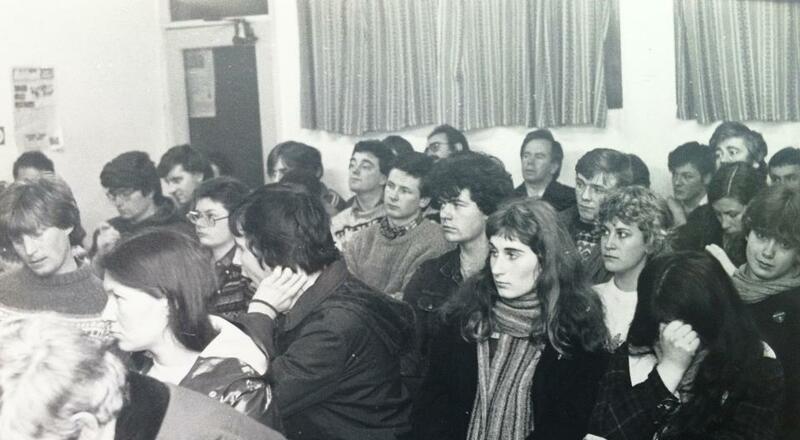 That's me yawning at a Militant public meeting addressed by Peter Taaffe in February, 1984. The meeting took place in the Atlanta Hotel on Dominick Street here in Galway. I now teach poetry workshops at Galway Arts Centre which is situated almost immediately across the road from where the Atlanta Hotel used to be. Despite appearances to the contrary, I was a madly enthusiastic member of Comrade Taaffe's organisation at the time and remained so for another ten years. Before my friend Darrell Kavanagh starts typing another email to tell me to stop going on about the Socialist Party/Militant Tendency because they are now irrelevant, I should say that this is not another carping negative post. It is an occasion of celebration. 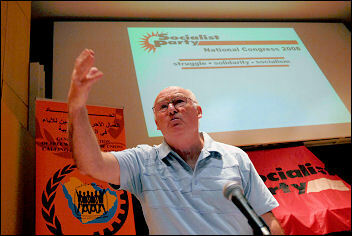 John Bulaitis has been in touch to say that he thinks we should do something to celebrate the fact that Peter Taaffe (pictured below making a very important point) this year celebrates fifty years as General Secretary of Militant/the Socialist Party. It has been pointed out to me that Peter has now been General Secretary for eight years longer than Comrade Enver Hoxha was in situ as General Secretary of the Albanian Party of Labour. Here's a video of Hoxha at a May Day celebration in Tirana back in the good old days when Albania was a deformed workers' state. 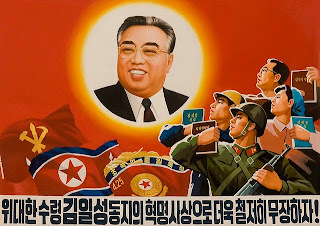 Peter has also heroically outlasted Kim Il Sung, who was leader of the Workers' Party of Korea for a (compared to Peter) paltry forty five years (1949-94). I agree with John Bulaitis entirely on this. Whatever political (and other) differences the tens of thousands of former members of what we used to call "the organisation" may these days have with Peter, we should be big enough to put all that aside and celebrate Peter's fifty years as leader of the vanguard of the international working class. 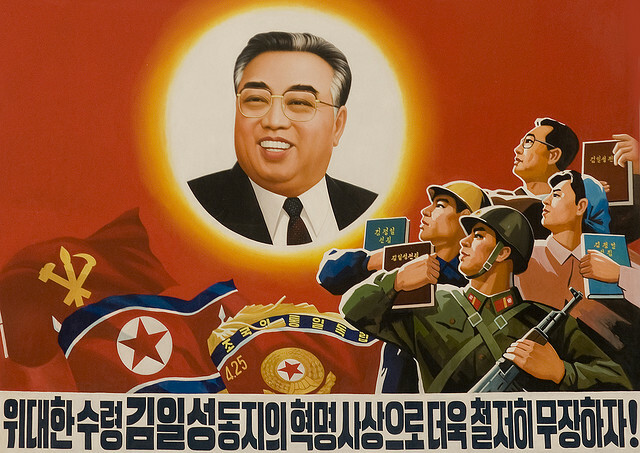 The Socialist Party congress took place earlier in the Summer in the suitably revolutionary venue of Clacton-on-Sea. The highlight was a long speach by Peter. He has also recently been busy denouncing dogmatists in Belgium, which is always good to hear. Peter is a man far too busy to celebrate the immensity of his own achievement. That being the case, it has been proposed that we book either Alexandra Palace or Wembley Stadium for a proper celebration, which could also double as a reunion for those who've passed through the ranks since Peter took over in the dim and distant year of 1963, back when Christine Keeler was a very busy young lady indeed and I hadn't yet been born. Myself and John Bulaitis will co-host the evening. I have yet to inform John about this, but I have no doubt he'll agree. Below is a picture of the co-hosts of this year's Eurovision contest. I plan to wear a dress similar to the one the woman in the picture is wearing. We are hoping that Derek Hatton will turn up and play a few tunes on his ukelele. ﻿Clare Doyle has agreed to play some One Direction hits on her harpsichord. There will be an interpretive dance (in fifty parts) by Paul Couchman to mark each of Peter's fifty years; I am particularly looking forward to his interpretation of 1994. There'll be a special performance by Tommy Sheridan, and, we hope, a guest appearance by Christine Keeler, who will present Peter with a replica of her famous chair. It promises to be quite a night. To get you in the mood, here is a poem.